"An unthinkable danger. An unexpected choice. Annabel, once the daughter of a wealthy merchant, is trapped in indentured servitude to Lord Ranulf, a recluse who is rumored to be both terrifying and beastly. Her circumstances are made even worse by the proximity of Lord Ranulf's bailiff---a revolting man who has made unwelcome advances on Annabel in the past. Believing that life in a nunnery is the best way to escape the escalation of the bailiff's vile behavior and to preserve the faith that sustains her, Annabel is surprised to discover a sense of security and joy in her encounters with Lord Ranulf. As Annabel struggles to confront her feelings, she is involved in a situation that could place Ranulf in grave danger. Ranulf's future, and possibly his heart, may rest in her hands, and Annabel must decide whether to follow the plans she has cherished or the calling God has placed on her heart." Let me start by saying I love fairy-tale retelling's. Let me also say that I am not religious, however I do not judge and I will quite happily read books with religious views or backgrounds. Lastly, I will say how disappointed I was by this book. The Merchant's Daughter is a loosely based on Beauty and the Beast, which happens to be my favourite fairy-tale of all time. But even I couldn't love it based on that fact. Annabel's family have put themselves in a "precarious" position in society, and now Annabel has to get them out. She is sent to serve Lord Ranulf, who she falls in love with. Obviously. Although this part of the story wasn't fantastic, I probably wouldn't have minded so much, if I wasn't constantly being slammed with religious views, and basically bashing on the Catholic church. Now as I said, I am not religious, but even for me this seemed very ridiculous. If you love fairy-tale retelling's and don't mind religious views then I say give it a read. However, if you are religious or sensitive in that regard, I would probably give it a miss. I am not religious either, but I hate it when people bash religion in books, at least in fiction. It's stupid and idiotic. Great review Claire. 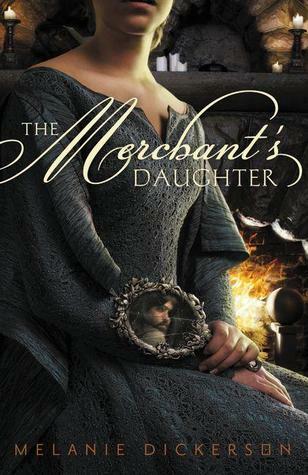 I have had my eye on The Merchants Daughter for some quite awhile and would like to give it a try.